Under the terms of a contract awarded in July 2017, the first of five Frégate de Taille Intermédiaire (FTI) or ‘intermediate frigates’ is to be delivered to the French Navy in 2023. The US$4.1 billion contract awarded to Naval Group (the former DCNS) includes development and construction of the five frigates, which will be based on a version of Naval Group’s design concept. It is anticipated that the first of the five frigates will be delivered in 2023 and enter service in 2025. The frigate has a displacement of 4,000tonnes and was originally intended for anti-submarine warfare. 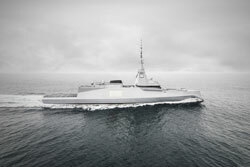 The French version of the design is also intended to respond to various French national needs and will be fitted with self-defence and special forces projection capability along with a new radar, Sea Fire, which is being developed by Thales. The vessel’s primary air defence missile will take the form of Aster 30 missiles from MBDA. In the longer term, Naval Group hopes that the frigate will find success on the export market, as has the French Navy La Fayette class frigates. Naval Group’s product line is completed by positioning the new frigate between the 6,000tonne FREMM multi-mission frigate and the 2,500-3,000-tonne Gowind corvettes. Naval Group has started to select the first equipment suppliers for the FTIs. Thales, sonar suite, electronic warfare suite, Identification, Friend or Foe systems and the ships’ communications system. In April 2018, Rolls-Royce confirmed that the contract for the diesel engines was the first order for the new 16-cylinder engines in its Series 8000 range. The French shipbuilding group has ordered a total of 20 MTU 16V 8000 M91L engines, each delivering up to 8,000kW. With the 16V 8000 engine, MTU has expanded its portfolio of engines. The Series 8000 now covers the power range from 7,200 to 10,000 kW. Like its 20-cylinder counterpart, the 16-cylinder engine was designed to have low operating costs, high power density and low environmental impact whilst meeting IMO Tier II and EPA Tier II emissions limits, with the ability to meet other standards as required.